This used Mobulator was designed to handle long tubes in vertical or horizontal orientations, in front or down either side (180 deg. swing) of the vehicle. The manipulator has a 400# capacity at 51" load center. This standup operator vehicle is 47" wide and 96" long. Overall dimensions including the Manipulator are 119" high and 137" long. This unit can be modified for a different gripping configuration, or have the manipulator changed entirely. Click on photo to see complete specifications. 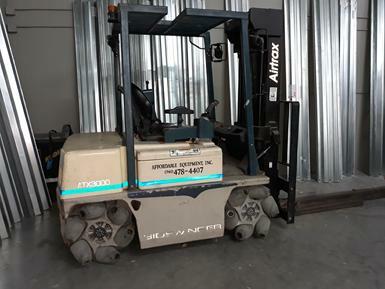 In order to schedule a viewing of this vehicle or to discuss price or make an offer contact Allen Hanna at ahanna@wlgore.com or 410-506-4658 from 7:30 am to 3:30 pm EDT Mon-Fri.
KING COBRA Scissor Lift is now available for sale from Rockaway Recycling. 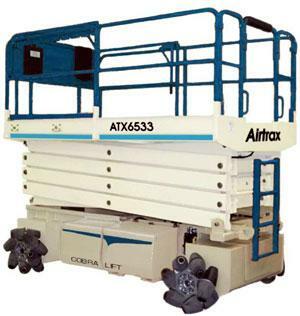 65 x 120 platform, 33' platform height, 1000# Capacity, barely used. 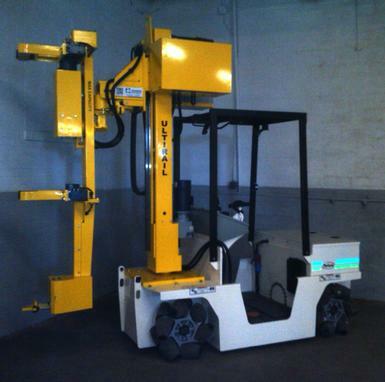 This unique lift can out manuver any other lift on the market. Side by side video comparison of it's superior performance is available. Check out the complete specifications by clicking on the photo. or 973-625-9560 for availability or to make an offer. This SIDEWINDER is currently available from All American Shutters in Tampa Florida. It has 706 hours on the meter and has mast cylinder seals recently replaced, and one new drive motor. Serial number A303A06B000044 indicates it was built in January 2006. It is equipped with a three stage 188 MFH mast and 42 inch forks.